Carry a bottle to the bar = best pickup line ever. "Mycok, it's just right for you." Side effects may include herpes and guilt. Only if she has herpus all ready ! I asked and he said, " Bend over and we'll find out!" MYKOC goes great with HERVAJ. 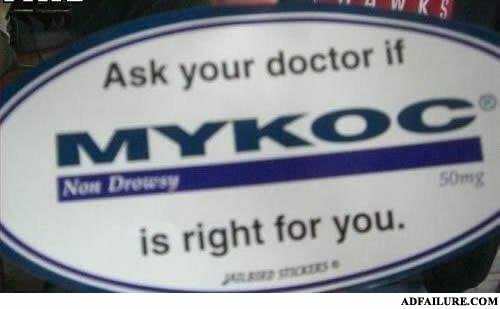 Or try our new Viagra variety, Mykocsaflopin! Directions: put MYKOC in your mouth and swallow. Repeat 10 times daily. Side effects include herpes and guilt. She'll give mykoc herpus ! !